VANCOUVER, British Columbia, Sept. 11, 2018 (GLOBE NEWSWIRE) -- Kutcho Copper Corp. (TSXV: KC) (OTC: KCCFF) (“Kutcho Copper” or the “Company”) is pleased to announce initial drill results from the Esso deposit at its 100% owned Kutcho high grade copper-zinc project located in British Columbia and enters into the mineral resource expansion drilling phase of the 2018 field program. 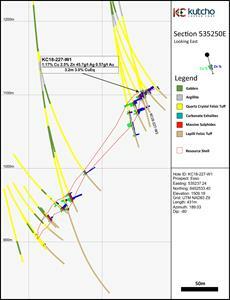 Drill hole KC18-038-W1 returned 28m of 2.09% Cu, 6.1% Zn, 65.8 g/t Ag and 0.82 g/t Au or a CuEq of 5.7% including a 10.4m massive sulphide intersection of 3.80% Cu, 14.4% Zn, 134.6g/t Ag and 1.84g/t Au or a CuEq of 12%*. In addition, drill hole KC18-227-W1 intersected massive to semi-massive sulphide mineralization that returned 1.17% Cu, 2.5% Zn, 45.7g/t Ag and 0.57g/t Au, or 3% CuEq* over 3.2m. 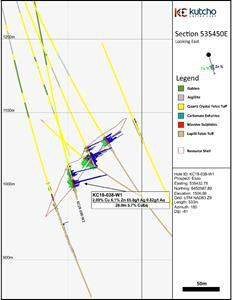 Cross sections of drill hole locations and mineralization are provided in Figures 1 and 2 below. Hydrogeological drilling and well installation has been completed at both Main and Esso. All geotechnical drill holes at the Esso deposit have been completed. Geotechnical drilling at the Main deposit is currently underway and is anticipated to be completed by the end of September. Completion of the surface geotechnical program that consists of a combination of test pit and drill hole investigations for engineering of the site infrastructure and tailings management facility. Metallurgical drilling at both the Esso and Main deposits is complete. Lab work to refine recoveries and mill process design will continue for the next 3 to 4 months. Baseline environmental programs including water quality measurements, terrestrial and aquatic wildlife surveys, air quality measurements and meteorological data collection at both the regional and site-specific scales are 50% complete. Components of this comprehensive program will be continuously on-going throughout the 2018 and 2019. Road engineering field studies have been completed along the proposed corridor to access the project from highway 37. The Company is also progressing detailed engineering studies, design work and trade-off studies (mining method, mine schedule, plant/throughput studies, tailings management facilities, site infrastructure) towards completion of the Feasibility Study, which is on schedule to be completed in Q2 2019. Kutcho has also commenced a surface program at the TCS property. The TCS property is located 16km east of Dease Lake and covers the Permo-Triassic Kutcho formation of bimodal volcanic rocks, which host the Kutcho deposits approximately 90km to the east. TCS presents a pure greenfields opportunity which has never been drilled. Previous exploration programs have identified mineralized and altered bedrock in creek outcrops and a 600m by 800m Cu-Zn soil anomaly. The 2018 program will consist of prospecting, mapping and soil sampling to potentially delineate drill targets for future campaigns. Diamond drilling conducted on the Kutcho property for 2018 isby Cyr Drilling International of Winnipeg, Manitoba, using Boyles BBS-37 surface drills, with HQ diameter drill rods. All holes were oriented using an ACT III core orientation tool and after completion of the drill hole, holes were surveyed using a downhole gyroscopic tool rented from Terraplus Inc. of Richmond Hill, Ontario. Kutcho systematically inserts certified standards, blanks, and field duplicates consisting of half core samples into each batch of samples at regular intervals. Samples are placed in sealed bags and shipped directly to the ALS Minerals preparatory laboratory in Whitehorse. The 2018 samples are analyzed by ALS Global of Vancouver, British Columbia. Samples are prepared by crushing the entire sample to 70% passing -2mm, riffle splitting of 250g and pulverizing the split to better than 85% passing 75 microns. The core samples also undergo a robust duplicate assay program that tests rejects and pulps for reproducibility. Samples are also sent to an umpire lab.